Ben Affleck is equal parts John Nash and John Wick in The Accountant, a new action thriller that’s much more exciting than its title may lead one to believe. Suspension of disbelief is crucial for enjoyment, not only in regards to the central casting (you’ve probably already decided whether or not you’ll buy Affleck as an autistic genius) but also as it pertains to the dubious plot elements that build on top of one another as the story progresses. There are bits of dark humor mixed in that suggest the movie doesn’t take itself too seriously and I would say that’s good advice for any audience member to follow as well. Affleck’s titular character is a methodical mastermind who masquerades as a small-town CPA using the alias Christian Wolff but makes his real living tracking down missing funds for international criminals and other powerful organizations. In order to evade heat from a probing, high-level Treasury officer (J.K. Simmons), he takes on a more legitimate assignment for the prosthetics company Living Robotics when their in-house accountant Dana Cummings (Anna Kendrick) spots some financial inconsistencies. The two form an unlikely bond as they work to uncover the suspected embezzlement, throwing around accounting terms and math equations as an unorthodox manner of flirting with one another. With an advanced background in military combat, courtesy of an army-trained father, the imposing Wolff turns out to be just as dangerous with a sniper rifle as he is with an Excel spreadsheet. This comes in handy when he and Cummings are marked as targets for an unnamed assassin (Jon Bernthal) after their snooping at Living Robotics proves to be more dangerous than they had anticipated. As the two make a run for it together, they uncover secrets from within the company and also from Wolff’s turbulent past that lead them to the inevitable culprit (and, in similar fashion, an inevitable shootout). It’s clear that this film wants to have it both ways, with director Gavin O’Connor trying to evenly split time making both a free-for-all action melee and a heady adult drama. It’s not always the easiest hybrid to negotiate, as the visceral combat can prove overwhelming on its own and the storyline tends to get more convoluted when left unchecked for too long. 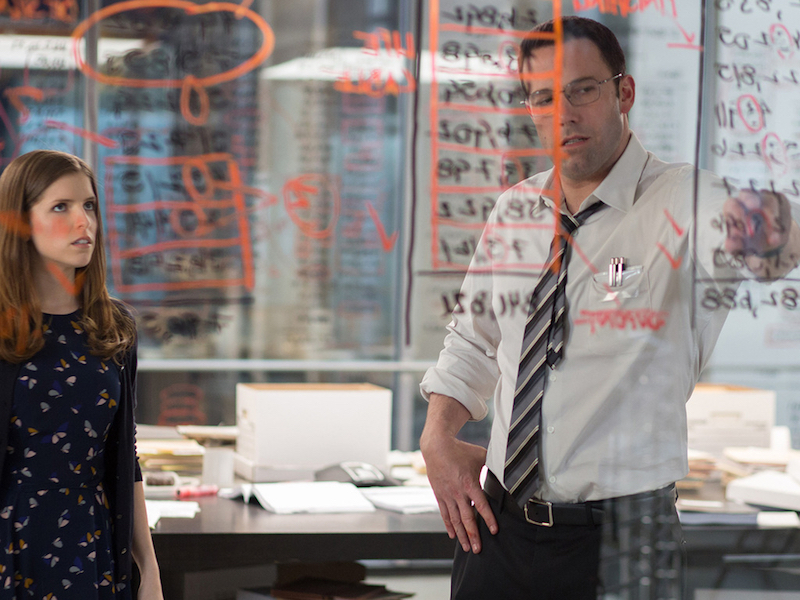 If the mixture of brain and brawn exists on a sliding scale, The Accountant is at its best when it splits the difference and finds its rhythm somewhere close to the middle of these two genres. Aside from these more broad categorizations, the movie is also layered with interesting details and idiosyncrasies that give it its own original spin on otherwise familiar material. Like variables in a complex math equation cherished so thoroughly by the lead character, small visual cues like a dent on a thermos or the brush strokes of a stolen painting lead to larger payoffs farther along in the story. It all adds up to a somewhat peculiar and highly entertaining piece of action fare; a brainy shoot-em-up that might make taxpayers think twice about double-crossing their CPAs come tax time next year.